This memo records Mr. and Mrs. John S. Craig's donation of $2,500 to endow a day in memory of their son. It also advises Miss Berry to invite them to the school because they may be interested in contributing toward a dormitory to replace Emory Hall. 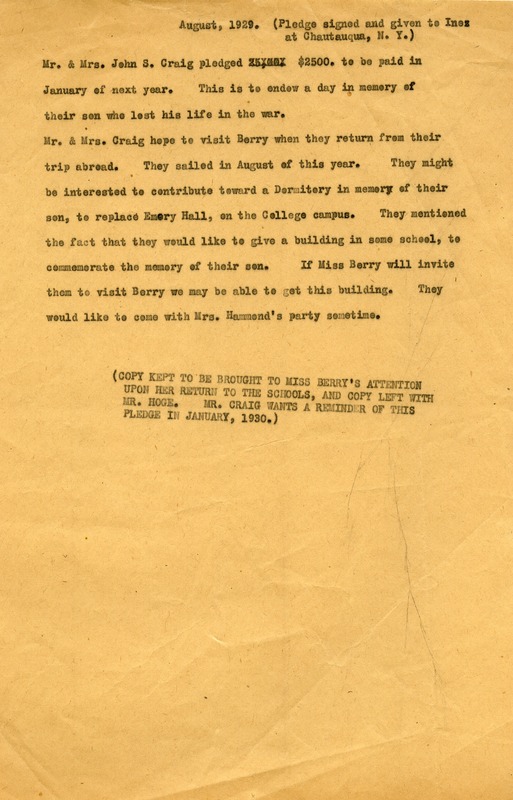 “Copy of internal memo at the Berry Schools.” Martha Berry Digital Archive. Eds. Schlitz, Stephanie A., Meg Ratliff, Allison Moore, et al. Mount Berry: Berry College, 2012. accessed April 24, 2019, https://mbda.berry.edu/items/show/9854.